The EOTech 552 with A65 reticle is a solid, night vision compatible, holographic sight. 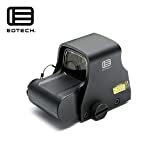 It’s an upgraded version of the 512 model, EOTech’s most popular holographic sight. Is this sight worth the money? Following along with this EOTech 552 Review as we dive into its features and how it stacks up against the competition. Check it out! Tiny 1 MOA aiming dot in the center for precise aiming. Large 65 MOA outside ring for quick target acquisition. Four quadrant ticks at cardinal points for leveling. It’s common for red dot sights to have a 2 MOA dot in the center. This larger dot is more noticeable than the 1 MOA of the 552 model. Meaning, you can line up the dot with your target faster. The 552 takes a different approach. It uses the smaller center to get tighter groupings. About 1″ at 100 yards for the 552 vs 2″ grouping for a 2 MOA red dot. What you have lost in target acquisition speed you make up for tighter precision. EOTech made up for the loss in acquisition speed by adding the 65 MOA outside circle. It’s very easy to see. Much easier than the 2 MOA dot. So, at closer ranges, your eye will pick up the target much faster. With the A65/1 reticle you get the best of both worlds. Pick up your target faster at close range, and more precise targeting at long ranges. This sight has a field of view of 30 yards at a 4” inch eye relief and features 30 scrolling brightness settings, ten of which are for night vision usage. The brightness adjustment range is 146,000:1 at its brightest and lowest, respectively. With the NV switch engaged, night vision compatibility is 1280:1. The sight itself has dimensions of 5.6” x 2” x 2.5” with a window dimension of 1.2” x 0.85”, and weighs in at 11.5 ounces. The front window is made of 1/8” inch solid glass while the rear window is composed of 3/16” inches of shatter-resistant laminate. The display window’s optical surfaces have anti-glare coating. This EOtech sight was specifically designed for close combat and versatility. It is made of aluminum and is easy to mount without tools thanks to its knobbed bolt. The EOtech 552’s battery will last 1,000 continuous hours of nominal use via lithium batteries and 600 continuous hours of use via alkaline (at brightness setting 12). The power source uses two 1.5-volt AA batteries and accepts lithium, alkaline, and rechargeable batteries. When you fire this thing up, it automatically flashes a battery check indicator reticle. It’s waterproof and submersible up to 33 feet while also sealed for fog-proof internal optics. This is another upgrade from the 512, which is only waterproof to 10 feet. All electronics used in this device are encased in a shock absorbent resin. While in operation, it can withstand a temperature range of -20 to 150 degrees Fahrenheit, but while in storage, the sight can handle a temperature range of -40 to 160 degrees Fahrenheit. The optics use parrallax-free transmission holography for minimal work to get a clear shot. The EOtech 552 has a 1x magnification to get even more target accuracy. The 552 and 512 are great for close quarter battle or ranges out to 600 yards (with magnifier). Both EOtech products mount on Weaver or Picatinny rails. They both run on AA alkaline or lithium batteries. The major advantage of the 552 over the 512 model is night vision compatibility. The better weather sealing is nice, but you, unless you know you will need it, weather resistance of the 512 is fine. If you will be using night vision in the future go with 552. It will definitely be worth the additional cost. All of these great features make the EOtech 552.A65 to be a formidable weapon sight in the right hands. After all, this sight has been standardized by the DEA, ATF, and FBI SWAT team and has been used as a top choice of military units like the Stryker Brigade and 3rd Infantry. The 552 holds its own in the market. 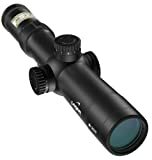 The cost of this rugged sight is well worth the features it boasts as a high end product. Whether used for hunting targets at the range or game in the wilds, this sight will help its users keep their aim true regardless of experience. When it comes to purchasing reflex style sights there are many available on the market today. One of the top choices is the Aimpoint Comp M4s. Aimpoint is one of the top names when it comes to optics and the M4s is one of the best that they offer. It is a simple, rugged sealed design that offers one of the longest battery lives available. One of the concerns of many people is the price point and it is important to note that the Aimpoint Comp M4s will take a man’s budget as it comes in at just over $700-$800. However, it is important to note that you get what you pay for and in this case, the sight is well worth the price. While there are many great aspects of this sight, the one con for most people is going to be the cost. If you are looking for a sight that is rugged, accurate, and reliable, the Aimpoint Comp M4s is a great choice. This is an uncompromising sight that can withstand deep water, impact, dust, dirt, mud, extreme cold and extreme heat. This sight is for those who are looking for something that will drastically improve their hunting capabilities in any type of situation. The reflex sight has 2 minutes of angle located on the lower settings and this can be extremely precise at 100 meters or more. When the brightness is increased the 2 MOA is increased creating a big ring around the area where the tube and glass meet. Looking for a useful review of the Eotech XPS3-0? Well, look no further! Here is our honest review of this high end sight. The XPS3-0 is lighter and smaller than any of the other holographic sights available and it is just as fast. Hunters and law enforcement officers will appreciate the compact size and weight of this sight as it is extremely easy to carry. The sight runs using a single 123 battery. This single battery configuration allows for more room for rear iron sights, rail space, magnifiers, and even a night vision mount. Brightness: 20 different daylight settings plus 10 additional settings for generations one through three and night vision devices. The Eotech XPS 3 is a top pick among hunters and officers for many reasons. It offers a laser diode as well as holography in order to display the reticle in the window. This is something that is not offered by many other sights. In addition, there is no tint on the glass, which means that the picture that the hunter sees remains perfectly clear. The main reason for this is because the laser can get brighter than the LED variants. This way, it does not need any tinted glass in order to create a contrast between the image and the reticle because it can do that on its own. In summary, this sight will allow shooters to aim more quickly and accurately without adding too much weight to their weapon. A very good choice for sure! The EoTech BLK G33 with its switch to side magnifier is lighter and shorter than its predecessor, the G23. This magnifier tenders an innovative and enhanced mount, offering a quick transition between 3X and 1X. It also hosts an azimuth tweaking system that is tool-free, a superior field of view, as well as a modifiable diopter for enhanced focus. 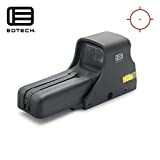 Few people can understand its popularity, but the mention of the following features will sure give potential buyers an idea of why the EoTech G33.STS.BLK G33 would be such a great buy. Besides its magnificent black finish, this magnifier has the ability to switch from CQB targeting to medium range targeting in a split second. 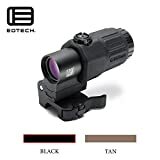 It offers 2.2 inch eye-relief with elevation and windage alterations which can be easily executed by hand, and a field of view range of 7.3 degrees. The slap to side mount is extremely durable and activates with the simple slap of a hand. It also hosts a locking and quick-detach lever which allows for easy attachment or removal of the mount and optic. While the EoTech G33 Magnifier may not seem like much, it truly makes a big difference to your overall experience. Not only does it enlarge the size of the EoTech Reticle, but also refines it effectively. On its own, the EoTech Reticle may seem ordinary, but with the addition of the G33 you will have an awesome unit. The magnifier does not add a lot of weight and the switch to side mount function can be performed for long periods on end without causing damage to the unit. With the unit in place, no added fluctuations will be experienced. When it is compared to similar items advertised at a higher price, this little powerhouse with its enhanced optics will outrank them all. Its quick-release system is also very effective as it allows for the instant removal of its sight when necessary. Of course, there are some negatives to the product. Its short eye-relief feature means that the user will have to lean in very close to achieve the appropriate field of view. Due to this, it puts the user in a less favorable condition in order to achieve the best possible shooting position. While it has its minor flaws, the magnifier is well-manufactured and extremely sturdy. Those who enjoy high quality options will find this magnifier with its military-grade hardware and exceptional optics to be a must-have accessory. Sometimes, it is not enough to just have a good aiming system; you will also have to count on a reliable magnifying module for maximum flexibility in the field. Aiming from a long range could be rather tricky, but a magnifying module, such as the Aimpoint 3XMag Magnifying Module ensures that you would not have such problems, as long as you know how to use this particular gadget properly. This model benefits from a variety of features, which make it stand out from the rest. For one, its compatibility with Aimpoint sights means installation is as easy as relying on a well-designed mounting solution that can further be mounted with a 30mm ring. The unit can also be used as a handheld magnifying glass monocular. Quick switching between modes, such as close quarter and long distance use, is also available. As far as optical data is concerned, this specific model counts on 3x magnification and seven degree field of view, as well as a 7mm exit pupil diameter. When it comes to harsher environments, this equipment could resist up to 67 feet of water, as well as extremes of -50 to 160 degrees Fahrenheit. One great positive aspect of this model is its compatibility with other items from the Aimpoint product line. Such flexibility offers easy access to complementary gadgets, which could greatly improve your performance. Aside from this, there has been unanimous praise for the design and durability of this product, thanks to the rubber outer coating, which not only protects the gear, but also enhances the client’s grip. Disadvantages are few and far in between, with several of them mostly geared toward the rather hefty price tag. While this model is known to be a bit more expensive, such generalization is actually disregarded by happy customers, who would like to prove otherwise. A magnifying module is quite an important component of every aiming system out there. 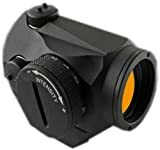 In addition to the powerful visuals offered by the Aimpoint 3XMag Magnifying Module, you also get to benefit from the clear resolution and imagery that it offers, which will help in terms of enhanced performance and accuracy. Purchasing one would prove to be a good investment, especially in today’s world, where gadgets are getting more and more expensive as they improve. This one, however, adheres well to industry standards and is definitely worth considering. Law enforcement and military personnel are considered experts when it comes to determining what makes an excellent riflescope. The Bushnell Elite Tactical G2 FFP Reticle Riflescope, 3.5-21x50mm was created with inputs from these gun experts. So, as expected, it has all the features a shooter would want from a top-tier riflescope. This tactical riflescope has a 3.5x to 21x magnification and 50-millimeter objective lens. Its G2 reticle delivers precise views of targets, even if a target is located several hundred yards from the shooter. Clear view of any object is guaranteed, regardless of weather conditions, due to the scope’s Rainguard HD lens. Meanwhile, it has an Ultra Wide Band Coating that improves clearness of view in low lighting conditions, especially at dusk and dawn. The riflescope has an overall length of 13.2 inches. The manufacturer has eliminated argon from the tube, in order to ensure the long-term reliability of the product. A three-inch sunshade is likewise incorporated in this product. Many of the rifle owners who have purchased this accessory are praising the scope for its amazing reticle. They cite that the reticle allows for precise measurements of targets, which make zeroing in on moving targets easier with this gear. The riflescope appears to have a solid construction; thus, users can bank on this gear to last for a long time. Its large knobs are easy to operate as well. Shooters will find these large knobs handy when they are making quick adjustments. Shooters will also love its good functionality, as well as the large 34mm diameter that provides additional strength. The riflescope’s 34mm diameter also allows shooters to have more room in making vertical and horizontal adjustments. However, some shooters will be dismayed by the lack of a zero stop of this riflescope. Without a zero stop, inexperienced shooters could find themselves going past a particular point in the travel range. This simply means that they could get ‘lost’ while twisting the knob. Other potential buyers may also get turned off by the expensive price tag. 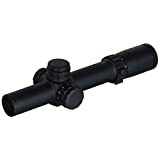 This riflescope has an average retail price of about two thousand bucks, although Amazon.com offers it at a discounted price. The Bushnell Elite Tactical G2 FFP Reticle Riflescope, 3.5-21x50mm is highly beneficial to experienced shooters who need a powerful, versatile, and durable riflescope for their weapons. With this piece of equipment, shooting from long range is easier. Shooters will also appreciate the clear views they get while using the scope, as well as the precise measurements of targets through the reticle. Hunting is a very challenging activity, especially when targeting animals from long distances. However, firing from a distance becomes easier with riflescopes like the Nikon M-223 2.5-10x40mm Laser IRT M-223 Riflescope, Matte w/ BDC 600 Reticle. This riflescope is a practical investment, as it combines speed, precision, and accuracy in one handy piece of equipment. This scope is equipped with Nikon’s Immediate Ranging Technology. Its BDC 600 reticle provides shooters with distinctively open circle aiming points, capable of assisting them in shooting from a distance as far as 600 yards. It has an eye relief of 3.5 inches and is integrated with the Ultra ClearCoat optical system. With the said feature, shooters can see their targets very clearly, even if they are several hundred yards away from it. Other features of this scope are a remote control that connects to most rifles, as well as a low-profile mounting system and zoom control with reference numbers that can be seen from the shooter’s position. The scope makes shooting from long distances seem like child’s play. Its IRT feature enables shooters to accurately hit a target from up to 600 yards away. After putting the reticle on the target, a shooter simply has to push the activator button of the scope. He then chooses the appropriate ballistic circle on the reticle. He has enough time to prepare for his shot, as the scope will continue to show the distance in just 12 seconds. This particular feature makes it an ideal hunting companion, especially when shooting moving targets. It is also easy to make field adjustments with this scope. A shooter simply has to spot at 100 yards and adjust the knob to zero before re-engaging. Aside from these advanced features, the scope also benefits from the solid reputation of Nikon. The brand is recognized as a global leader in the manufacturing, marketing, and distribution of riflescopes. The only downside to buying this scope is the amount of money that a shooter would have to spend. Priced at more than $600, not everyone can afford to own one! Despite the prohibitive price of the Nikon M-223 2.5-10x40mm Laser IRT M-223 Riflescope, Matte w/ BDC 600 Reticle, it cannot be denied that it is a very practical and interesting addition to any shooter’s hunting gear. Perhaps you have tried lots of illuminated scopes in your lifetime, and not all of them were be up to the challenge as far as precision and accuracy are concerned. Most of the choices available in the market today are a hit or miss. If you have done your research, though, you know that the Weaver Tactical 1-5 x 24mm Illuminated Intermediate Range Scope is an exception to this rather disappointing lack of options. In terms of features, this particular model relies on a 30mm one-piece Argon purged tube, complimented by multi-coated lenses and protected by a reinforced exterior case. In terms of power adjustment, the unit has been devised to accommodate aggressive knurling. With magnification that can be amped up to five times the normal rate based as well as true 1 power at the lowest magnification setting, you are bound for a good experience overall, as far as accurate visual imaging is concerned. Much has been said about this particular model’s advantage over others. On one hand, you have the zoom feature, which allows up to five times the normal size, providing for more precision as far as clear visuals are concerned. If you are considering something apt for intermediate range, then this model fits the bill and offers an incredible experience that is hard to match by another model within the same price range. On the other hand, a common complaint received on this product is regarding the rather heavy frame, although this is considered to be a minor setback in comparison with other models, which weigh a lot more. If used in tandem with more add-ons, it can be quite heavier than usual. Another negative aspect is be the price, even though it is already understandable that equipment of such quality will most likely command such a price tag. Weaver has been in the forefront when it comes to the production of dependable intermediate range scopes, and the Weaver Tactical 1-5 x 24mm Illuminated Intermediate Range Scope is no exception to this brand’s quest for excellence. If you want an optic which would permit you to effectively use your rifle in intermediate range, make up for lack of proper illumination, and count on a tool that is built to last, then you have just found the very product you are looking for. Size and weight matter when it comes to firearms, given that the success of your aim are highly dependent on the strength and endurance of your grip. The grip, in turn, is determined primarily by the quality of the equipment you have on hand. This is exactly what they had in mind when they devised the Aimpoint Micro T-1 4 MOA Night Vision Compatible Sight, a lightweight and compact aiming system that does not compromise function in lieu of form or design. Getting a good visual could very well be the difference between life and death, which is why it is important to make sure that you have a reliable aiming system with you in order to minimize risks. This particular model counts on unlimited field of view and eye relief, a sturdy structure which is highly adaptable to extreme conditions, a mechanical switch, which permits speed and dependability, as well as compatibility with most generations of night vision devices. In addition to what has already been mentioned, this model also has a mount, which is hinged to the sight body, thereby enabling effective recoil absorption, minimizing damage for the device. There are also provisions for adjustment as far as windage and elevation are concerned, making it more flexible for rough terrain. Installation is easy, thanks to the protective caps, which easily fit the holes on adjustment screws. Moreover, it could be used independently or in tandem with other vision optics gadgets. The main advantage of this model has always been its compact exterior and its lightweight nature, which means less weight for the entire firearm as a whole. As such, precision and accuracy are not sabotaged by too much unnecessary weight. As for the drawbacks, there are not so many, and its only known defect so far is how the battery cover tends to loosen up due to the tension, although this could easily be remedied by tightening the bolts again. The Aimpoint Micro T-1 4 MOA Night Vision Compatible Sight is the perfect companion for your firearm, if you want to be able to retain accuracy and precision through the help of a visual aid that does not weigh too much, and which gives you a better grasp, not just of the equipment, but also of the situation at hand through the powerful visuals you see. Featured Review: smaller and lighter than other holographic scopes, the EOTech XPS2-0 is a great compact option for your weapon platform. Today we are going to be checking this awesome scope. What are the specs of this scope? We will start with the actual dimensions of this scope which are 3.5” X 2”X2.4” inches and weighs only 8 ounces. As can already tell this compact scope will not weigh your gun down at all, and you will still be able to react quickly to any sudden need to shoot. The EOtech XPS2-0 offer 1x magnification of all objects and has unlimited eye relief. The window dimensions on the front of the scope are 1.20” by 0.85” inches and the window is made from solid 1/8” thick glass. The rear window is made of shatter resistant laminate that is 3/16” inches thick. The field of view that is offered is 30 yards at a 4” inch eye relief. The brightness range can start at 146,000 at its brightest to 1 to the lowest. The power source is a 123 lithium battery and offers over 600 hours of use without a recharge. That is truly an amazing feature for such a small scope! What are some great features? Instead of a normal battery cap and latch this scope offer a simple o ring with tethered cap so weather elements stay out of this scope, and will last a very long time. Because this scope offers such a short base you are going to be able to use it on any gun with very minimal space needed. This is an awesome trait for someone looking for a compact red dot shoot. This model is one of the shortest models available and it was specifically made for people who simply do not have much space on their gun but want a red dot scope to help them achieve better hunting results. This sight is able to leave space for other things such as rear iron sights, magnifiers and other tools that you may want to have on your gun. This scope is able to withstand temperatures from -40 degrees to 150 degrees F, and it is also waterproof and submergible for up to 10 feet. There is such great sealing used with product that there is virtually no fog that will be seen on this scope. There is an adjustment range of +/- 40 MOA so you can choose what settings you what you need. This model also uses a laser light to illuminate the holographic red reticle that will be projected on target that only you will be able to see. This will help you better hit your target. As you can see, this compact XPS2-0 is a very easy to use sight that will help you hit your target each and every time. If you are looking for a smaller type of sight this may be the best choice for you. There are many awesome reviews on this model so please take the time to look them over.